007 was the shizNITE! I'll give you $200! I agree. 007 is worth about 20 bucks max imo. Adventure?!? BWAAHAHAHA. Five cents and it's a deal. In fifty YEARS it might be worth 150$, in mint condition and still in the box. That is, if we survive the Seventh World War. not to imply that i have been...sleeping on... the job. Btw, if a copy of the original half life was in there, i would totally spend suitcases full of cash for it. Unfortunately my suitcases are filled with orphan meat. I was making a meat dragon and not just any meat will do. Sad panda. 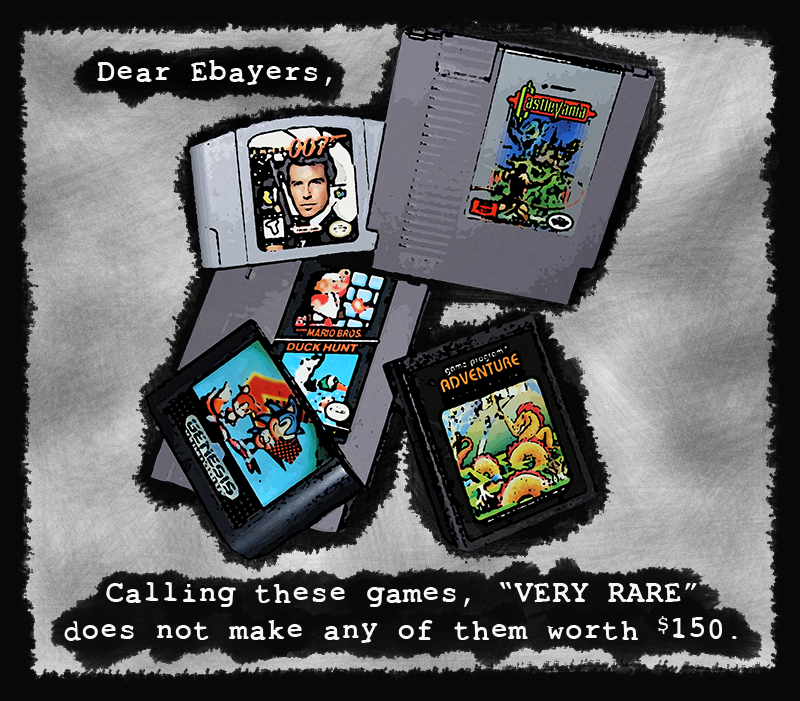 You could argue that all of those games could "rarely" be shoved into some ones body and come out playable. If some one did that and then sold them then DAMN would they be "VERY RARE".